I’m not sure what zucchini pomodoro is. The interwebz has a few theories, and my naming of this sauce comes from exactly one thing. This place in Greenville that we like, Adam’s, has a side dish that is called zucchini pomodoro and it’s squash in what tastes like creamy tomato sauce so…. 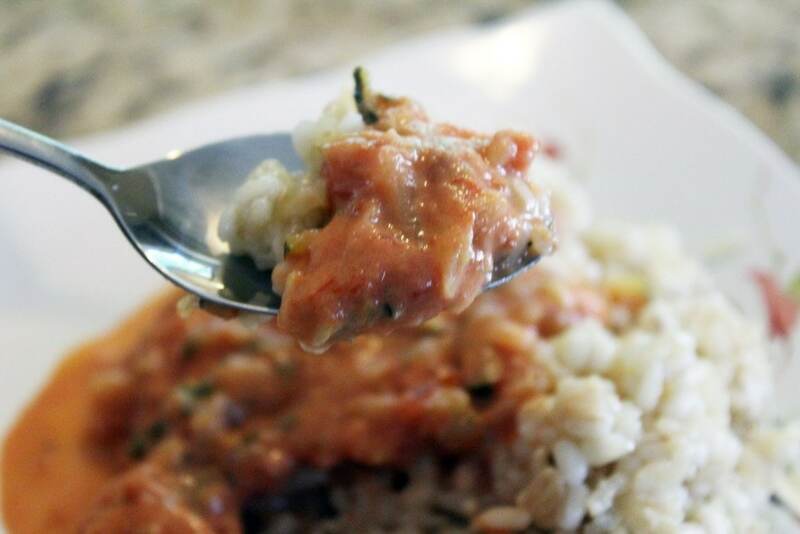 I made zucchini with creamy tomato sauce. Makes sense, right? My bff Heather and I get it as a side with our meal every time we go there even though we always say we’re going to try something new. This sauce, though. 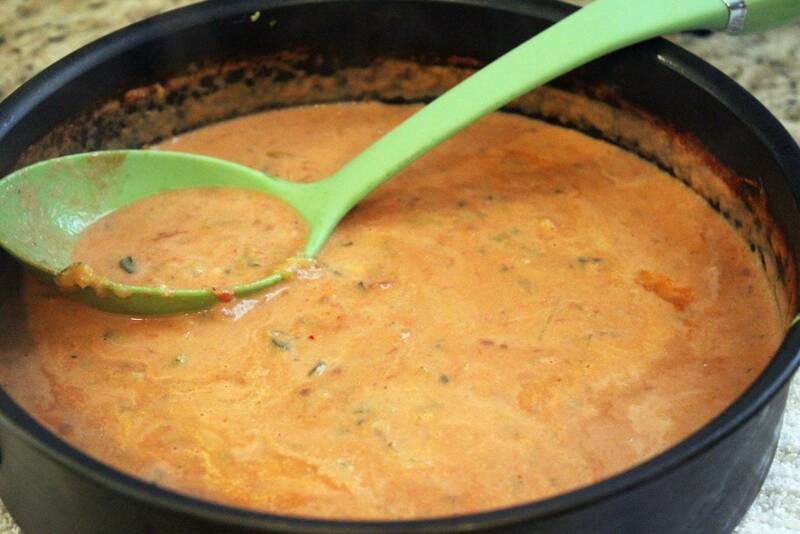 Whatever you want to call it, it’s SUPER simple and ends up tasting like this vodka sauce but with zucchini and without 3 hours of your life taken up so that’s A GOOD THING. This is really delicious. Promise. 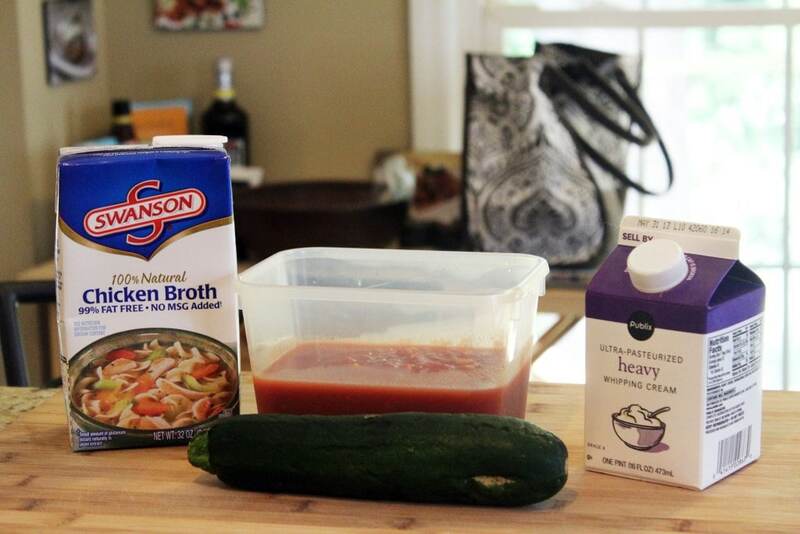 You need marinara sauce, 1 zucchini, chicken stock, and heavy cream. You can use vegetable stock too, I won’t tell anyone. 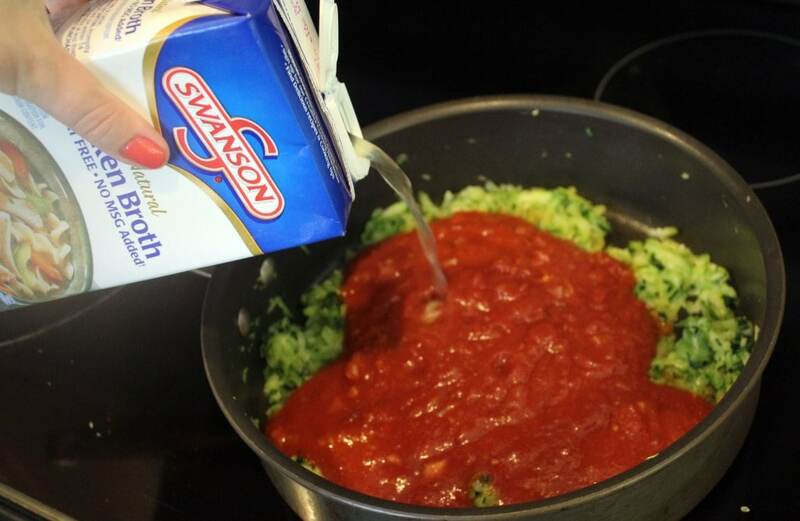 Now, if you’d like to make the marinara that I make, you can click here to see how I do it. 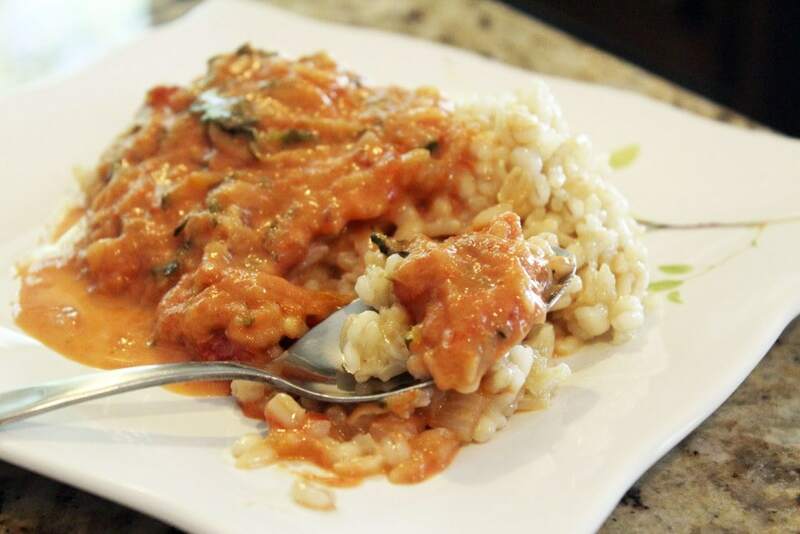 I’ve included a separate recipe for homemade marinara in the printable recipe below. If you’re making the marinara at the same time as the sauce, though, do the onion/olive oil, then zucchini, then add the garlic, then add the tomatoes, sauce, and cream. You don’t need to make the marinara separately – I just did because I was making it for something else last week. ANYWAY. 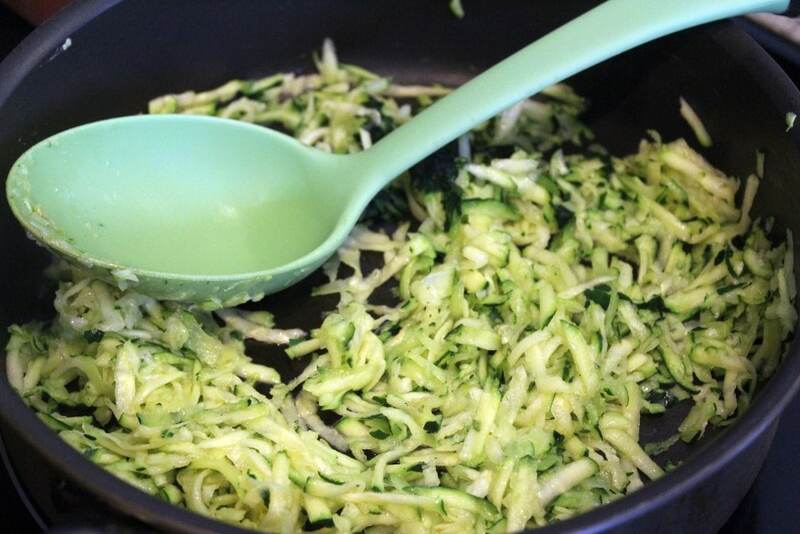 You preheat a pan to medium heat with a bit of olive oil and grate the zucchini. I love this because it gives a really nice texture to the sauce, but you could chop the zucchini if you’re feeling sassy. Add the zucchini to the pan, and cook it for 5 or so minutes until the liquid starts to release and the zucchini softens slightly. Then, add the marinara and stock! 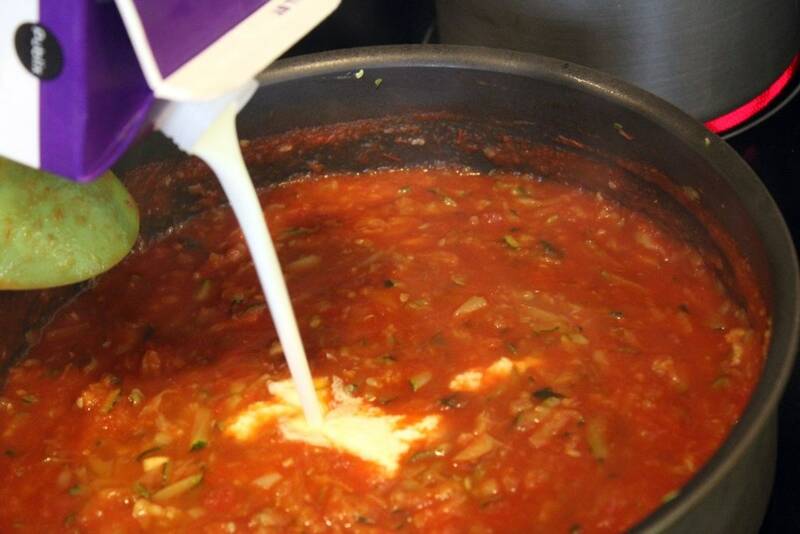 I like to start with 1/4 cup of stock, then add more as the sauce thickens – how much you need will depend on how thick your marinara is to begin with. 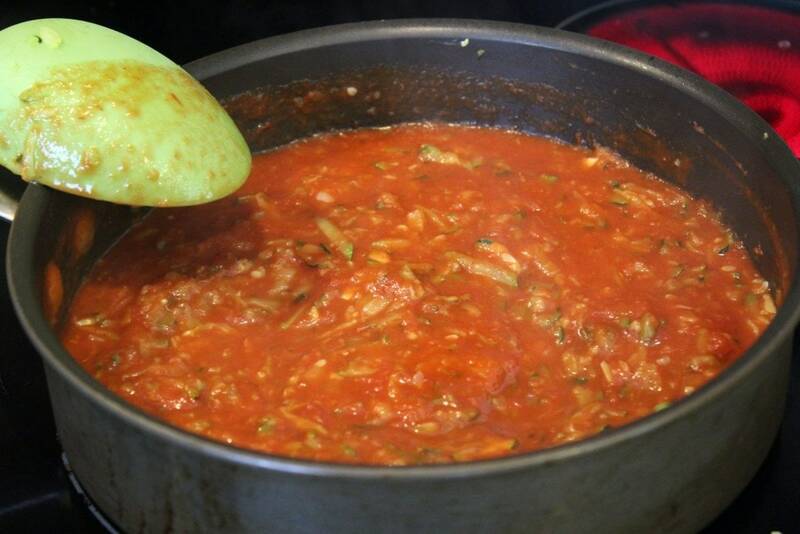 Stir the marinara and stock into the zucchini, and let the sauce come to a bubble. Then, stir in the cream! Look at what a lovely pink color this is! Stir everything together, and taste – add more salt if you’d like, or a sprinkle of sugar if you like a sweeter sauce. This is ready to serve right now, or you can let it simmer very gently on the stove for 20 minutes or so, adding more stock if the sauce gets really thick. That’s it guys, and this stuff is GOOD. I kept mine pretty thin with 2/3 cup of stock or so in order to drizzle this over the pilaf I showed you yesterday and the lemon chicken I made for my mom on Sunday. I swear I could eat this as soup. 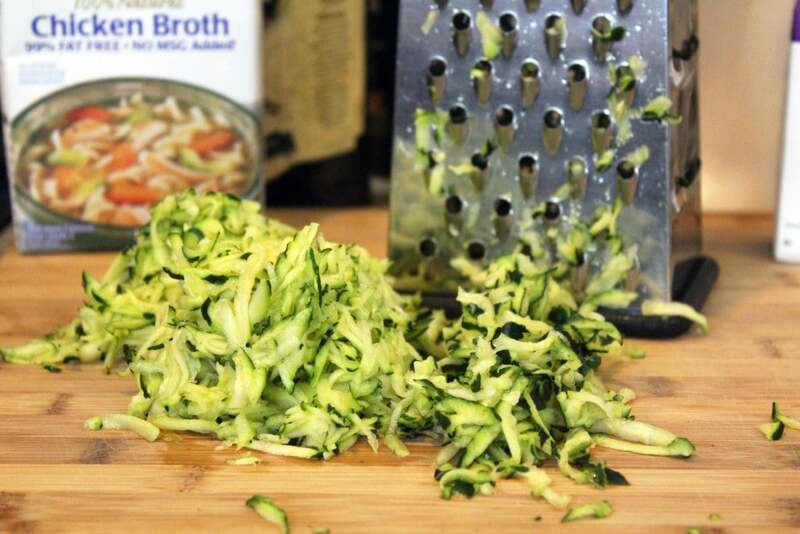 If you’re not big on veggies, grating them is a GREAT way to get them into some meals without big chunks of green stuff wrecking your life. I love zucchini, but I still love the texture we get here with the grated squash. 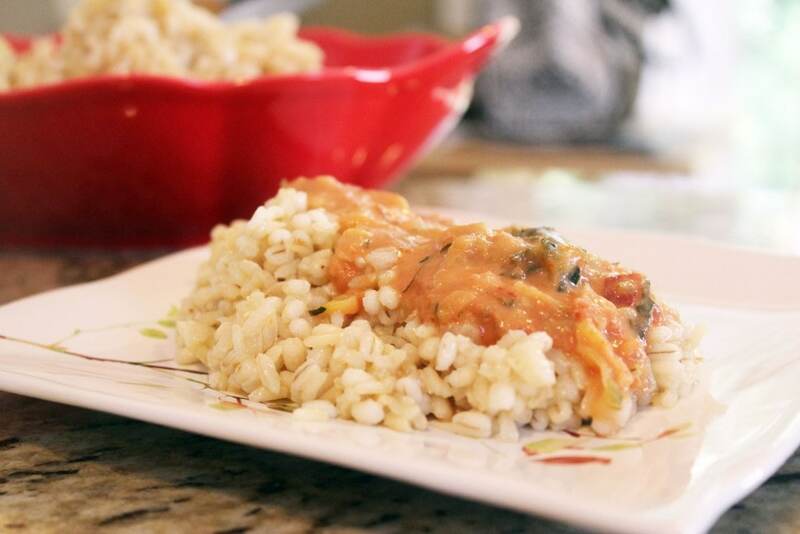 Look how pretty the sauce looks over that brown rice pilaf. Such a great, simple DELICIOUS meal in a very short amount of time. 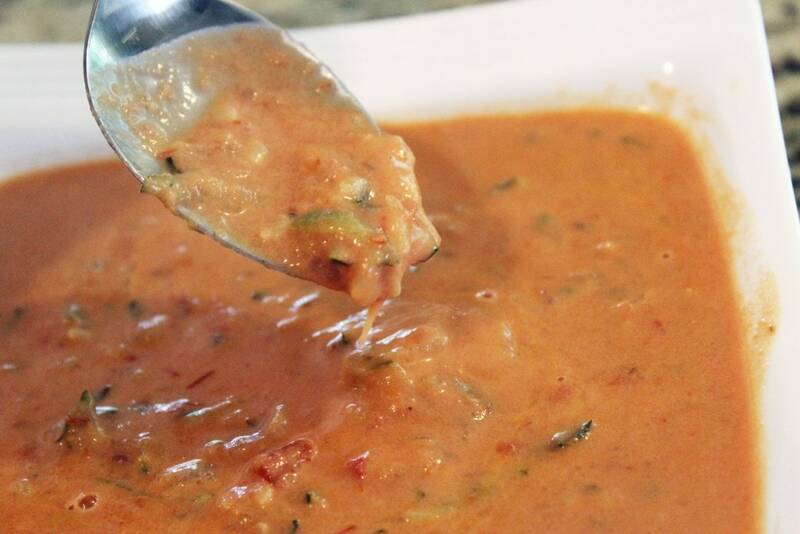 You could use the sauce over pasta, veggies, rice….whatever. Enjoy this one! Heat a skillet to medium heat with the zucchini and a drizzle of oil. Cook for 5 minutes until some of the liquids have released and the zucchini starts to soften. Add the marinara and 1/2 cup of stock. Stir, and bring to a bubble. Add the cream. Taste, and add salt to your preference or a pinch of sugar if you like a sweeter sauce. Add more stock as the sauce simmers to maintain a not-too-thick consistency. 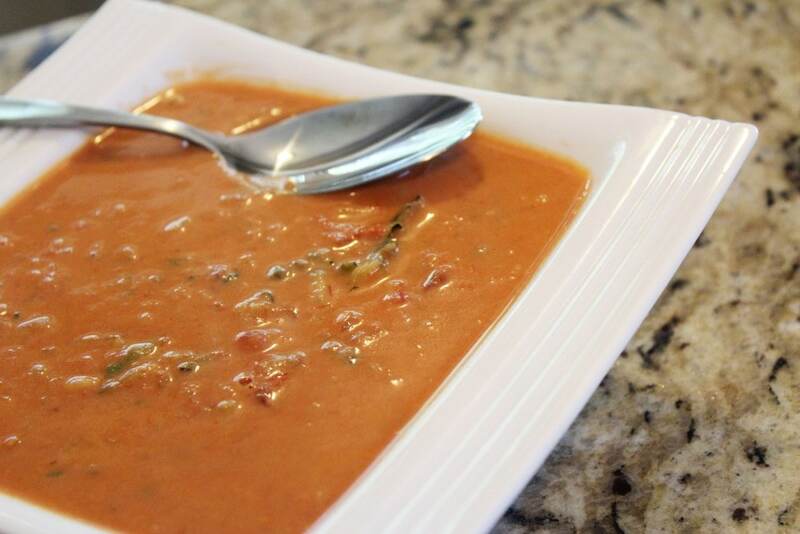 Serve with bread, rice, pasta, or any way you like! Preheat a skillet to medium heat with a drizzle of oil, the onion, and crushed red pepper. Cook for 3 minutes until the onions are slightly softened, then add the garlic and a sprinkle of salt. Cook for 2 minutes more, then add the tomatoes and sugar. Stir, and simmer for 15 minutes until fragrant and the flavors have combined. Taste, and add more salt or sugar if needed. If the sauce becomes very thick, add some water to thin it. Store in the freezer or fridge, and use as desired. If you're making the marinara at the same time as the pomodoro, combine the steps! Heat a pan with the onion and zucchini for 3 minutes, then add the garlic and crushed red pepper with a sprinkle of salt. Stir until the veggies are soft, then add the tomatoes and stock and bring to a bubble. Add the cream and sugar. Taste, and add more seasonings to your liking.